Get your pen and notebook or digital journal ready for the next National Journal Writing Month (NaJoWriMo) starting July 1st. The theme for the month-long journal writing challenge is Travel: Places and Journeys. This theme and journaling prompts will focus on two types of travel: writing about places we have traveled to or plan to travel, and journeys —the road we have taken in our life so far. Journal writing is a great tool for writing about traveling because it allows us to capture and reflect on what we experienced and learned from both our physical travels, and the journeys we’ve made in our lives. And the big plus for journal writing is looking back (rereading) what we wrote and how our past experiences have shaped the direction of our life. I’m participating the third National Journal Writing Month Challenge, starting July 1st. I invite you to join me. The theme of travel will also be about where we plan to go in our life, both physical places and personal goals. Travel is an opportunity to make plans, to get out of our comfort zone, to visit new places and meet new people. The poet Nikki Giovanni once said that travel and good food are two experiences that can never be taken away from you. Those experiences will stay with you forever. You can subscribe to the theme for July or another theme in the NaJoWriMo store. The thematic prompts for July will be ready next week. But you can also use another theme if you like. Just make sure to order your theme on June 30th in order to get your prompts to begin arriving on July 1st. Write in your journal about anything you want for 30 days straight. Or take the 15,000 word challenge. See this page for more details about the levels of participation. 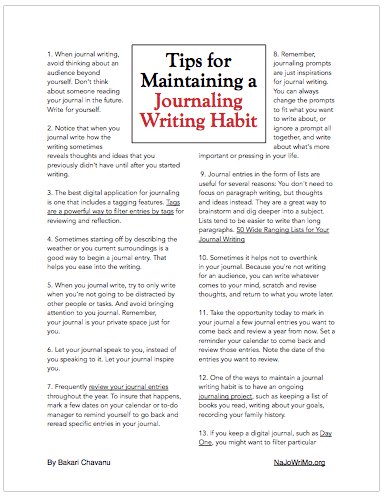 Develop a journal writing habit. Let me know what you think of the theme for NaJoWriMo July. If you have any suggestions for the theme, please write them in the comment section, or email me directly using the Contact form. Did you mean to have #4 and #9 be the same? Sorry, not sure what you’re referring to. The prompts for day 4 and day 9 are both about making a list of the places you would love to travel to. At least I think they’re both the same. Ah, thank you for pointing that out. One of them should have been, Make a list of all places (cities or countries, or tourist spots) you have traveled to, and the other one, Make a list of places you would like to travel to. I will update that. Thank you. Awe, this is really great to hear. I would like to use your comment as a testimonial. It’s always great to hear how journal writers find the prompts useful. I think the theme is a terrific one for summer. Thanks for doing this Bakari. I enjoy doing these so very much! Hi Denise, thanks for the feedback. I’m looking forward to the theme as well.